As a public higher education institution, the University at Albany has both an obligation and an opportunity to be a leader in sustainability. Our institution can and should serve as a model for other colleges and universities as well as for our own students and the community around us. To see what we are doing to be more sustainable visit our Sustainability Dashboard! 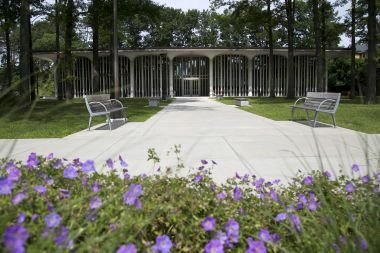 The University at Albany will be starting the formation of a Climate Action and Sustainability Plan. Vist our webpage here to learn more about the working groups and how you can get involved!. Do you know a student, faculty or staff member that makes a positive impact towards the sustainability movement at UAlbany? 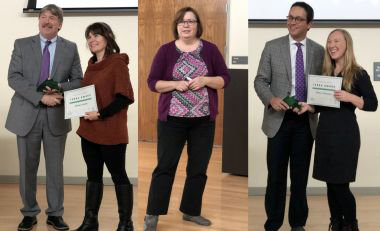 Each semester the Office of Sustainability recognizes one student, one faculty, and one staff member for their commitment to advancing sustainable culture at the University. 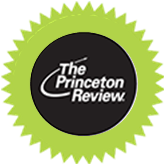 Click here to learn more about the award and to fill out an application form online. RecycleMania is a friendly competition and benchmarking tool for college and university recycling programs to promote waste reduction activities to their campus communities. The University at Albany has participated in this nationwide program since 2006. Check out our website here for our 2018 data and stay tuned for involvement opportunities this spring! 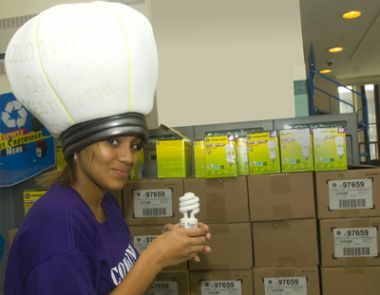 Think your UAlbany office is green? Earn an eco-certification by enrolling in the Green Workspace Challenge! Click here to fill out the Self-Assessment Sheet to start your path to Green Workspace certification. Are you part of an on campus office? Are you interested in being part of the office composting program? Contact gogreen@albany.edu to get more information or to get involved. Reserve, unlock, and go with Zipcar, our car sharing service! Student organization leaders can now sign-up for free! 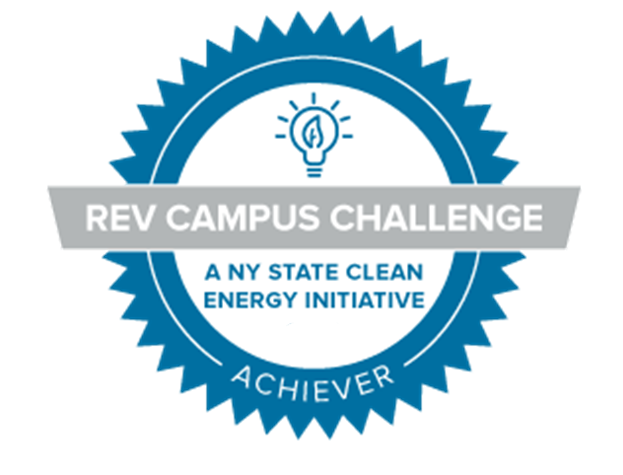 Check out the latest infromation about what we are doing at UAlbany to be more Sustainable! 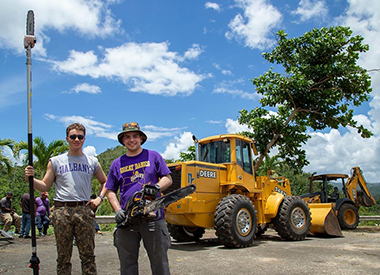 Last May, 30 students from the College of Emergency Preparedness, Homeland Security and Cybersecurity (CEHC), along with two staff members, were among the first group of SUNY volunteers to assist with the island's ongoing Hurricane Maria and Irma recovery efforts. Dozens more from the campus community followed during the summer. Now, the University’s service work is continuing into the new year. 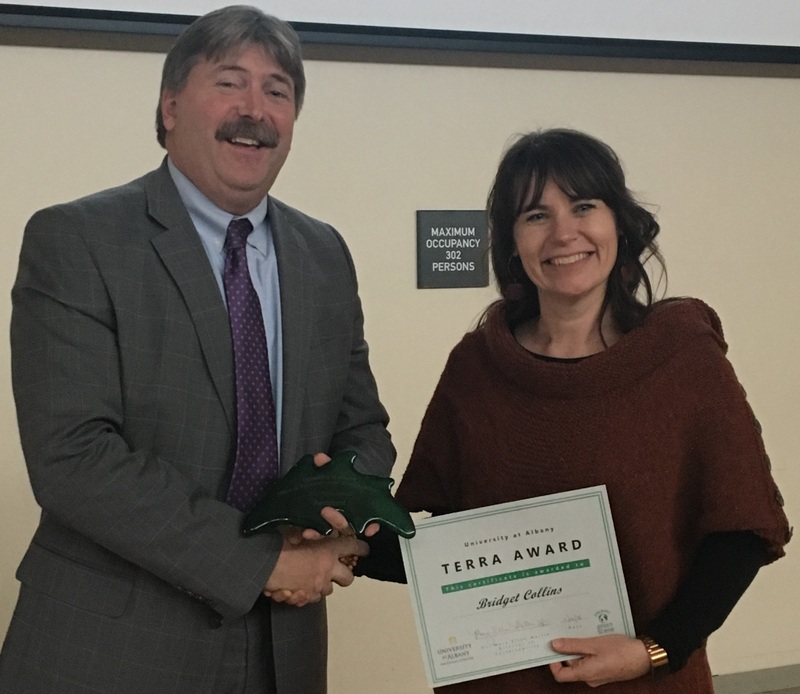 The University reduced energy usage by 8 percent, saving 291 tons of carbon dioxide during this fall’s 10-week Energy Campaign, which ended in mid-November. That’s the equivalent to taking 62 cars off the road for a full year, said Mary Ellen Mallia, the University’s director of sustainability. If warming trends continue, Quelccaya, which until recently was the world’s largest tropical ice cap, will have reached a state of irreversible retreat by the mid-2050s, according to a new study led by UAlbany climate scientist Mathias Vuille and recent Ph.D. graduate Christian Yarleque. Scientists have observed a shrinking of the Quelccaya ice cap, located in the Andes of Southern Peru, for decades. Building 25 looks the same from the outside — classic Edward Durell Stone lines in a two-story building set among the pines. 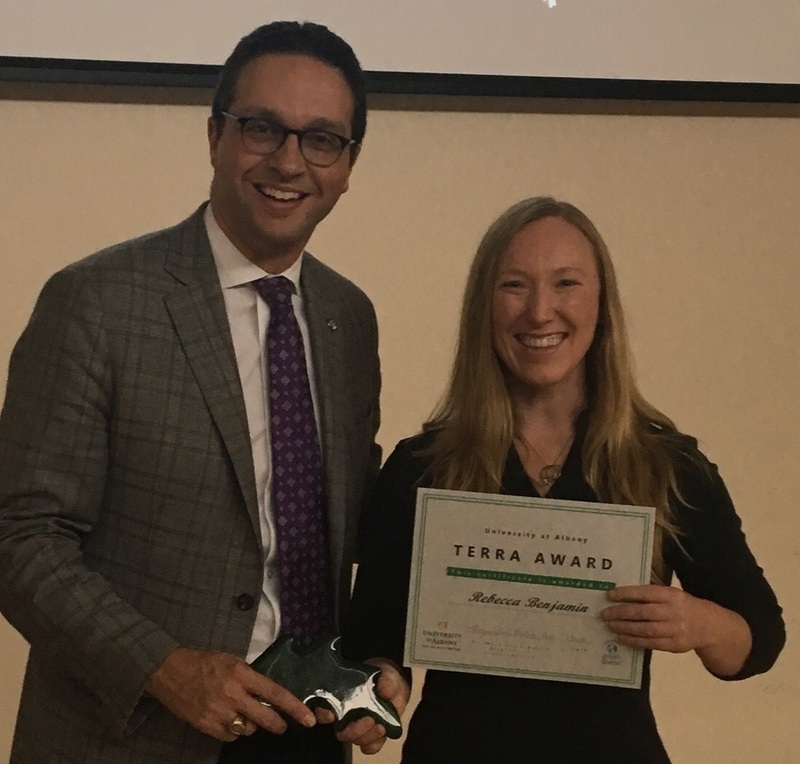 But a nearly two-year-long project changed the academic building both inside and out, and last month the University got the plaque to prove it: a Platinum LEED certification, the highest rating for energy-efficient design. 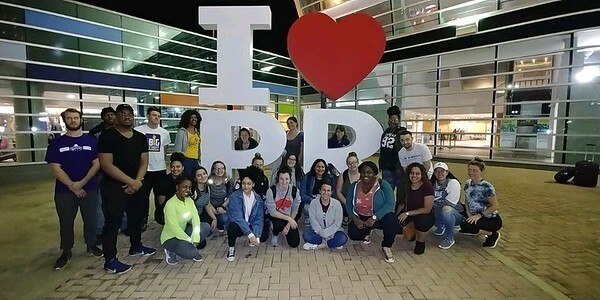 In late May, 30 students from UAlbany’s College of Emergency Preparedness Homeland Security and Cybersecurity (CEHC), along with two staff volunteers, led the way, as part of the first group of students to depart. Turning off a light, refilling your own water bottle, taking the stairs — the small steps we take every day to save resources and reduce energy usage that really add up. How much? Last year during the Office of Sustainability’s annual Energy Campaign, the campus community reduced its carbon emissions by 247 tons. 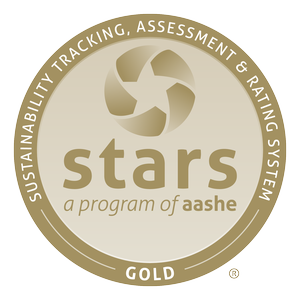 UAlbany achieved a Gold rating in STARS!